Horticulture production in India has been surpassing the production of food grains for many years. In 2014-15, the total production of horticultural produce was estimated by the Department of Agriculture, Cooperation and Farmers Welfare, Ministry of Agriculture to be approximately 281 million tonnes as against 252 million tonnes of food grain production and 275 million tonnes of oilseeds. Horticulture and floriculture have result in growing foreign earnings, and India’s domestic market is also growing. In fact the demand for many types of vegetables and fruits which are not native to India such as lettuce, broccoli, gherkins, as well as for exotic flowers such as orchids, gerberas, carnations, is soaring. These crops were initially being cultivated only for export, but are now being bought by the urban population within India as well, as a result of growing familiarity with other cultures, and shifts in cuisines and lifestyles. Many of these crops require specific climatic conditions which are not available in all parts of India, hence, cultivating them in controlled environments is a preferred option. Other than providing them a hospitable environment, the yield of the crop can be significantly better and availability can be all-year round, providing better market prices in the off-season. Greenhouses can be used by farmers for years to grow and sell exotic vegetables and other high-value commodities. 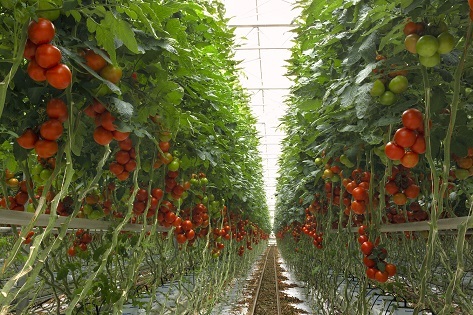 Moreover, greenhouses help reduce the expenditure on pesticides by warding off insects and pests, many of which are carriers of viral and other infections. There is, therefore, considerable merit to extending the area under this system of cultivation, for the benefit of both producers and consumers. While greenhouses have existed for more than one and a half centuries in various parts of the world, in India use of greenhouse technology started only during 1980’s and it was mainly used for research activities. The commercial utilization of greenhouses started from the late-1980s and with the introduction of the Government’s liberalization policies and development initiatives, several businesses were set up as 100 per cent export oriented units. Now many progressive farming organisations and individual farmers are using varied levels of technology in order to control the environment in which agriculture is done. Although, there is an upfront capital cost involved in the setting up of a greenhouse, the scale of the greenhouse and proper management helps in yielding viable results. Most of the greenhouse projects in India at this point of time are on landholdings of up to 1 acre. However interest is seen to be growing towards projects of larger landholdings. Capital costs per acre range from Rs. 15 lakhs for a basic green house with simple techniques to control temperature and humidity, to Rs. 1.5 crore for automated greenhouses with superior humidity and temperature control, more closely managed water and nutrient dispersal etc. Protected cultivation is one the important interventions of the National Horticulture Mission. Various patterns of assistance in the form of subsidies (ranging up to 50% of the cost of setting up the structures) have been devised by the government to encourage farmers to engage with this form of cultivation. To encourage cultivation of vegetables under controlled atmosphere, Punjab government has empanelled five firms to assist farmers to set up polyhouses and polynet houses in their fields. The state government will provide subsidy on the greenhouse structures erected by these firms. In Khammam, Telangana, the Horticulture Department is readying two poly-house demonstration units to popularise greenhouse technology and help farmers take up cultivation of high yielding vegetables round the year under controlled weather conditions. Projects have already been taken up in Telangana, Gujarat and Himachal Pradesh ranging from feasibility studies of green house facilities and distribution halls for grading, sorting and packing to designing and setting up of green houses for breeding of rice and other crops and cultivation of tomatoes, strawberries, capsicum, cucumbers and lettuce. For higher end, larger scale farms, Indian growers are also exploring technology from Europe. For instance, the Netherlands is the traditional exporter of greenhouse grown flowers and vegetables all over the world. The Dutch greenhouse industry is one of the most advanced in the world, and has now also become a provider of technology and support for the development of greenhouse cultivation around the world. Advanced technology solutions include climate sensors, air treatment devices, and software support. However, success doesn’t only depend on equipment. Organisations such as Koppert provide biological solutions for natural pest control, natural pollination and seed treatment, to not only improve the quality and yield of the produce, but also make it safer. There are many Indian as well as international organisations providing greenhouse solutions ranging from materials, technology and project consultancy. In the coming years it is expected that India’s rich agricultural, horticultural and relatively newer floricultural expertise will get enhanced and further competitive with the adoption of greenhouse cultivation to feed the burgeoning global and domestic demand.